Viareggio is a popular resort, located on the Tuscan coast of the Ligurian Sea. In summer, people come here because of the sea, and in winter, they come to visit the carnival. After the famous Venetian Carnival, the second largest carnival in Italy takes place in Viareggio. The Carnival of Viareggio includes mask parades, masquerade balls, night parties and fireworks, theatrical performances, gastronomic festivals and sports events. At this time, the city resembles a magical kaleidoscope. It consists of a colorful crowd of friendly Italians and everyone who arrived to Viareggio in February. In 2017, the main events of the carnival – the parades – will take place on 5 and 12 February (Sunday, 3 p.m.). On February 18 (Saturday, 5 p.m.) there will be not only a parade, but also the fireworks show. Carnival will continue on February 26 (Sunday, 3 p.m.). The final parade and awards ceremony is scheduled for February 28 (Tuesday, 3 p.m.). On the same day there also will be the grand final fireworks show. You should not worry about the fact that most of the events are to be observed standing. According to the majority of travelers, it is a best way to see everything that is going on around you. Place: Viareggio (Tuscany, Lucca). The bus and train commute is highly developed, and the nearest airport is in Pisa. Date: 5, 12, 18, 26 and 28 February 2017. Cost: from15 euros, package tickets – from 30 euros. Free admission for children who are under 120 cm. Once upon a time, the group of the Tuscan aristocrats decided to organize a carnival parade of carts here. But the ordinary people have interpreted the carnival differently. They dressed up and laughed heartily at such an exemplary celebration and at the nobility. This is how the satirical carnival in Viareggio was established. 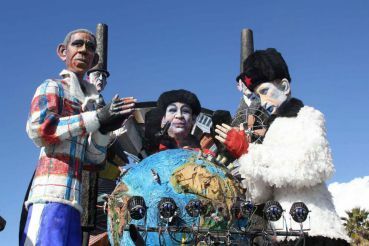 Carnival in Viareggio has earned the fame of being bold and accusatory. You can easily spot masks of politicians and public figures. After all, the desire to make fun of politicians and public figures was the reason why the carnival started its existence in 1873. Burlamacco Mask is the emblem and symbol of the Carnival in Viareggio. According to one of the versions, Uberto Bonetti (author of this mask) signed his magazine caricatures this way. In Viareggio there is a whole Carnival City. Those are hangars, in which the carnival platforms are built. It also includes a school of sculptors and masters of papier-mache, as well as an arena for carnival show. Huge puppets, made out of papier-mache, are created in the hangars. After that they go into the carts. In order for one of such carriages to go through Viareggio, about a ton of papier-mache and 400 kg of paint is used. Theatre and circus shows, masquerade balls, fancy dress parties, sport evnts, wine tastings and gastronomical events... But that's not all! There are always competitions like "Miss Viareggio" and the best carnival mask. Battle of the Oranges 2017, Ivrea. In May 2014, held a spectacular cultural event - Cavalcade Sard.